Albert Paley (American, b. 1944). Teapot, 1967. Sterling silver and rosewood, 8.75 x 11.25 x 6”. Kamm Collection 2000.18 Photo: David H. Ramsey. Albert Paley is internationally known for his monumental sculpture, elaborate gates, intricate furniture, and striking jewelry. His metalwork, which exudes great strength and energy, is skillfully executed utilizing a range of time-honored metalsmithing practices. Paley began his artistic career at Tyler School of Art in Philadelphia from which he received a Bachelor of Fine Arts in 1966 and a Master of Fine Arts in 1969. Although he often wavered between sculpture and jewelry, Paley chose the latter for his graduate work. This decision meant he could continue studying under the esteemed jeweler Stanley Lechtzin. Paley thrived under Lechtzin who was “technically demanding” and stressed “professionalism.”[ii] Furthermore, jewelry provided certain challenges for Paley. He believes that “… [he] had to concentrate more, [he] had to focus more, [he] had to put more energy into it to master the disciplines…”[iii] Paley’s jewelry of the 1960s and 1970s is bold, ornate, personal, and large. His necklaces, brooches, and bracelets often mirrored the body’s curves and movement. This award-winning teapot is made of raised and fabricated sterling silver. [vi] Its body is slightly-tilted, bulbous, pear-shaped, and lively. On one side a conical spout curves upwards. On the opposite side a rosewood handle reaches out turning downward. These two features, extending in opposite directions, create a gestural line that flows across the form. A hinged domed lid attaches to its top. Like his jewelry from this time, this teapot captures a sense of motion and illustrates Paley’s talent with metal. Today Paley is probably best known for his work in bronze, iron, and steel, particularly his massive sculpture and gates. However, his explorations on a smaller scale played an important role in his artistic development. He learned how to forge, a direct process that always appealed to him, while working with silver and gold. In addition, Paley’s experiences with precious metals and its associated practices tested him as an artist. Without that background, it is probably safe to say that his career might have had a different trajectory. Since the Portal Gates, Albert Paley has continued to exhibit, obtain significant commissions, and share his knowledge of metal. He is applauded for his ingenuity as well as bringing greater attention to the field of metalwork. Perhaps this attention is because Paley ‘s forged and fabricated forms appear to straddle that much-debated line between the fields of craft and art. Much has been said about the fact that “he produces craft objects that are art, and art objects that are craft.”[xi] Nonetheless we can all agree that he truly is a master of metal. Lucie-Smith, Edward. The Art of Albert Paley. New York: Harry N. Abrams, 1996. Albert Paley. Oral History Interview with Albert Paley. Archives of American Art, 1982. Palladino-Craig, Allys, ed. Albert Paley: Sculpture, Drawings, Graphics, and Decorative Arts. Jacksonville, FL: Florida State University Museum of Fine Arts, 2001. [i] http://www.albertpaley.com/index.cfm?Page=Artist%20Statement, (16 April 2018). [ii] Edward Lucie-Smith, The Art of Albert Paley (New York: Harry N. Abrams, 1996), 13. [v] This chalice was created for Pope Paul VI for the 41st International Eucharistic Congress in Philadelphia. 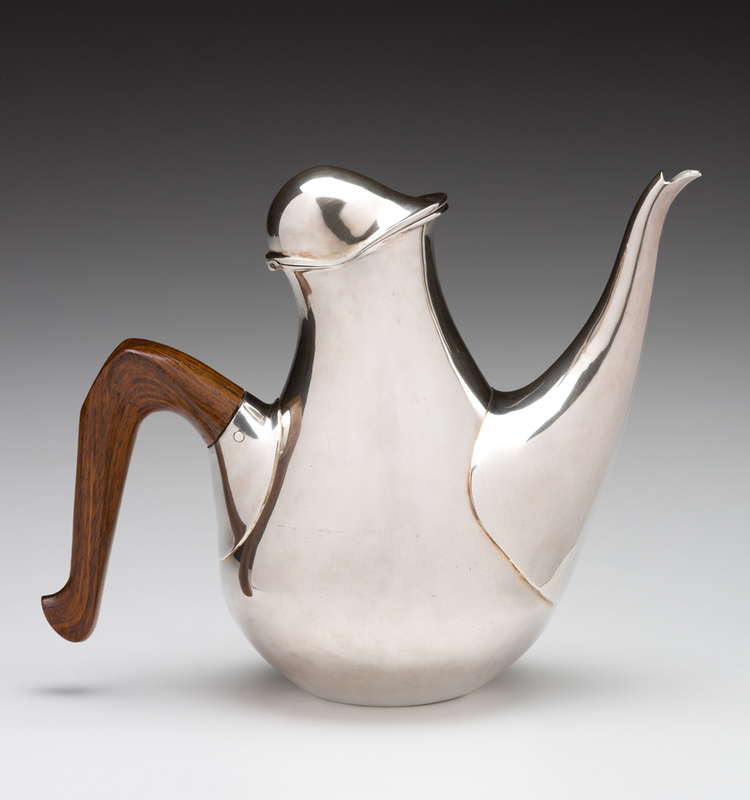 [vi] This teapot received an award in a Sterling Silversmiths Guild of America national competition. [ix] The Renwick Gallery is currently considered a branch of the Smithsonian Institution’s American Art Museum. [xi] Allys Palladino-Craig, ed., Albert Paley: Sculpture, Drawings, Graphics, and Decorative Arts. (Jacksonville, FL: Florida State University Museum of Fine Arts, 2001), 4. Allie Farlowe is a metalsmith, jeweler, and independent arts writer. Her previous professional experience includes museum and gallery work in curatorial and registration departments.